A farmer picks vegetables from a greenhouse in rural Jordan. The United Nations agriculture agency and the World Bank have opened a new chapter in their longstanding partnership by further strengthening their cooperation to end hunger and poverty at global and national levels. The two organizations have signed a new agreement to work closely together supporting the member countries in meeting the Sustainable Development Goals (SDGs), improve rural livelihoods, enhance efficiency of food production and distribution, and ensure sustainable management of natural resources worldwide. The framework agreement – which enables the UN Food and Agricultural Organization (FAO) to provide technical expertise to governments for projects funded by the World Bank -– was signed yesterday in Rome by Daniel Gustafson, FAO Deputy Director-General for Operations, and Hartwig Schafer, the Vice-President of the World Bank's Operations Policy and Country Services. This enhanced partnership realizes faster mobilization of FAO assistance to member countries in order to advance the 2030 Agenda for and its corresponding SDGs. “The tools […] will increase financial resources for development, especially in situations of protracted crises and fragile States,” says to Mr. Gustafson in a response during the signing ceremony. The new agreement will go beyond FAO and World Bank investment programmes, says Mr. Schafter in a video interview. Through the FAO Investment Centre both international bodies have been working together for over 50 years providing development support to invest in agriculture and rural development. The Centre has contributed to over $100 billion worth of investments worldwide. 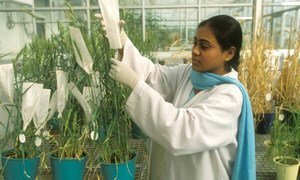 The United Nations announced today at a meeting of the world’s top agricultural scientists, that in order to achieve world’s Sustainable Development Goals (SDGs) of defeating hunger and poverty by 2030, governments and the private sector must increase commitment to agricultural science and technology research.